Women nowadays love styling their hair even though they are aware of the damage that the hair styling can cause. Blow drying, curling, straightening, colouring, ombre or highlights - when it comes to hairstyles, there are so many to choose from. As much as women would love to try out new hairstyles every now and then, they know that constantly changing looks will cause their tresses to suffer in the long run and cause damage. Hair damage is caused by a combination of chemical treatments, styling routines and environmental factors. 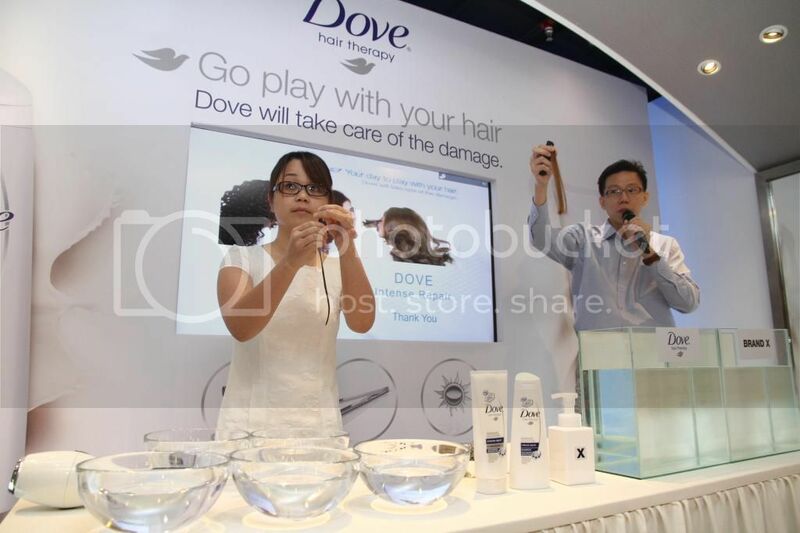 Therefore, Dove launched their 'Go Play With Your Hair' campaign at La 'Mode Coiffure, Midvalley weeks ago. Dove wants women cast off the negative emotions they feel about hair damage and instead be adventurous and feel free to experiment with different hairstyles or continue their much-loved styling routines with the knowledge that Dove can help repair the damage. Hair damages are not only caused by hair colouring or perming but everyday routines such as brushing, blow drying and exposure to UV rays. As wet hair is more fragile and susceptible to breakage, combing it when it's still wet causes damage. Even while blow drying, it removes moisture from hair and the heat is also damaging the hair fibres. Most of us are outdoor for work purposes or leisure and the harmful UV rays from the sun may break down fine fibre particles of the hair and strip off its natural oil. You can see their healthy hair even though they permed, coloured or straightened them. Dove Intense Repair range nourishes hair with ingredients such as Keratin Repair Actives that penetrate deeply to help restore and strengthen hair, protecting it against future damage. Continuous care with the Dove Intense Repair Shampoo and Dove Intense Repair Conditioner will keep hair strong and the duo will also help give 97 per cent fewer split ends. All the products in the range have a beautiful fragrance, luxurious texture and are designed to delight the senses as much as to work wonders on damaged hair. 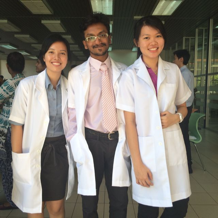 Mr John Goh taught us some basics of the hair structure. 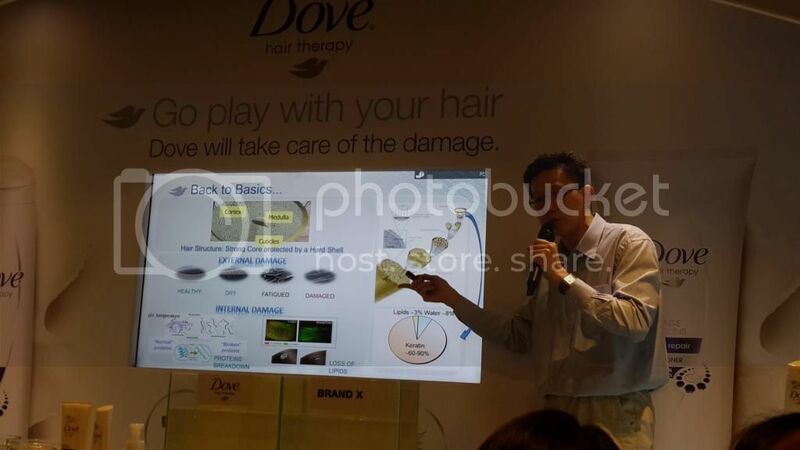 Live demonstration was done on the day itself to witness the difference of the coloured hair strands using Dove Intense Repair range and Brand X. From the experiment, I could see that by using the Dove Intense Repair products, it helps to rebind and restore damaged hair proteins. The hair strands normally float on the water if your hair is healthy because the hair has low porosity. Low porosity hair repels moisture when you try to wet it and is hard to process since it resists penetration of chemicals. Live demonstration of hair porosity test. We were then divided into 3 groups to go to the designated booths to carry on with the activities such as Accessorize Your Hair, Style Your Hair and Play with Your Hair. Each group will take turn to decorate their hair bands with sequins, flowers, or ribbons. 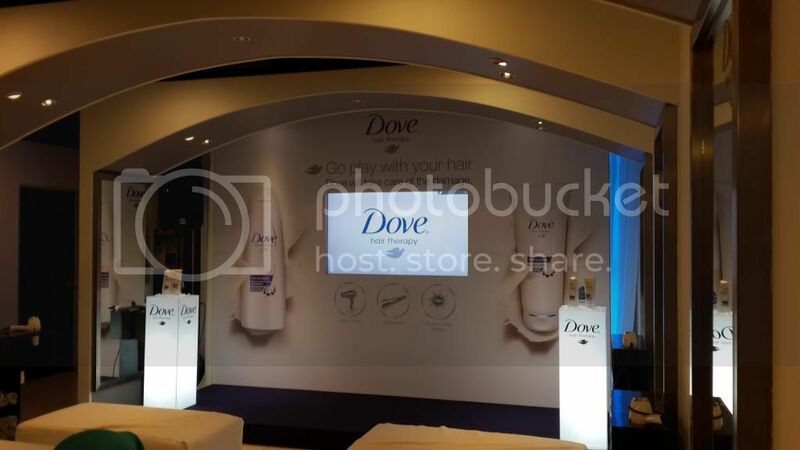 We were given the opportunity to go for hair wash using Dove Intense Repair range and we were asked to choose which hair styles that we wanted to. 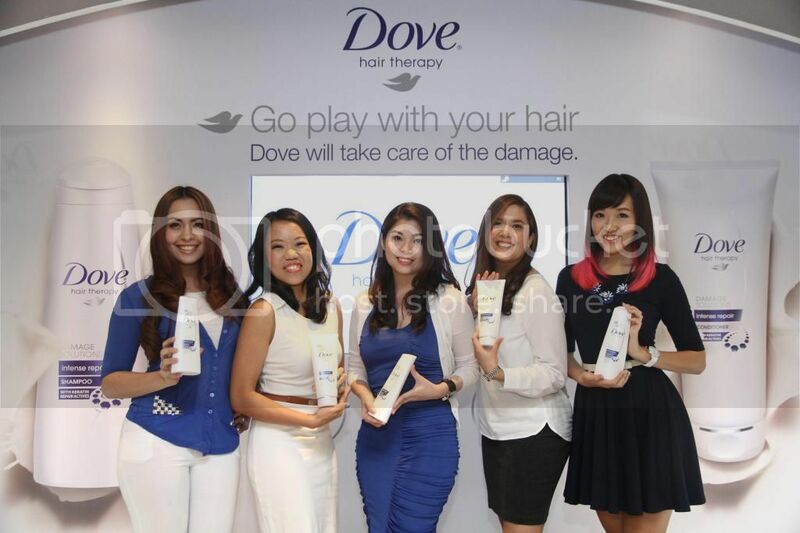 In conjunction with the launch, Malaysian women can participate in the "Go Play with Your Hair" campaign by logging on to www.dovehair.com.my. Remember to upload a photo based on the challenge according to their choice and participant may submit multiple entries and the contest period is from 17th October till 28th Nov 2014. The Grand Prize Winner will stand a chance to win a trip to Boracay, Philippines worth RM4500 for 4 days and 3 nights based on the most creative hairstyle and the number of challenges joined. There will also be 10 weekly winners who will be bringing back 6 in 1 Hair Styling Kit and Dove Intense Repair range worth RM100 each. 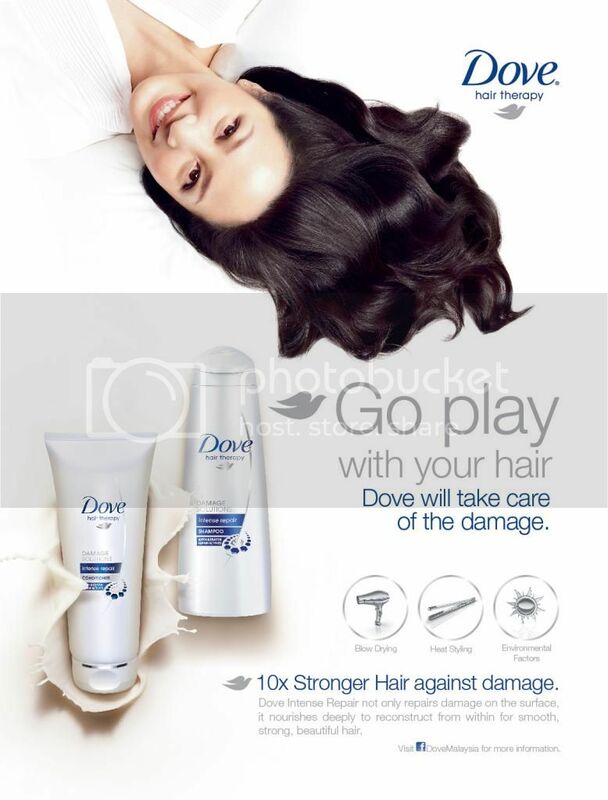 So go crazy and play with your hair - Dove will take care of the damage!